Are you tired of the Republican and Democratic Parties? Find out more about the Libertarian Party this Tuesday, Jan. 31, at 7 pm, at the Libertarian Party of Orange County’s monthly business meeting. This meeting is where the Libertarian Part of Orange County we discusses and plans the direction of the LPOC. Anyone is free to attend, but you must be a current dues paying member of the LPOC and have signed the non-initiation of force pledge to vote on party business. 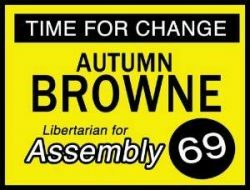 I am registered Libertarian for last 20 years and when I was running for the city council and mayor of Santa Ana they wouldn’t endorse me, even though no other Libertarian ran. The local chapter is just bunch of communists and activists like the Green party and have nothing to do with Libertarianism. The Recall Party is your best bet these days. Well Fiala, it is hard to garner such endorsements with your sometimes abrasive style. Why don’t you run against Janet Nguyen? I will make sure you get the endorsement. Liberty is just hat, Liberty!….. not Pure. However, in your case you have been virtually a member of every party even the “non of the above”, so what would you know about Liberty? Like President George Washington, I don’t put much stock in political parties, but I have found the Libertarian Party reflects best my political views. You are certainly free to conduct yourself as you please but politics is not just about issues. You have to garner support. How you treat people then is important. Lastly, what do I know about liberty? I know that this land is the land of opportunity. Anyone can rise as high as they want to. Sadly the red and blue parties seem hell bent on increasing the size and scope of our government. That of course is where the Libertarian Party comes in. We may not win much but we at least are talking about freedom and liberty. Our ideas do matter. The fact remains that the locals do not support their own! No, they just didn’t support you. No offenses Admin, but you have done much more damage to the ethics in this county and they supported you. That speaks about the character of the locals. You see Fiala, statements like that, which are uncalled for, is what I’m talking about. I have no beef with Nguyen! She saved myself from the grave embarrassment of supporting Paul Walters for OC Sheriff. Only Nguyen figured out that Walters is coward of the county. And you calling me “abrasive” was called for? Read your own post about your own nightmares! Just calling it like it is. And your behavior on this thread proves it. No man is an island Fiala. If that would be true, what do you call yourself?… Huh? I’ll leave that to my readers to decide. I just try to write interesting, informative and entertaining blog posts. You’re a smart guy, with much to offer, but I suggest you focus more on solutions and less on petty vendettas. Come to the Libertarian meeting and I’ll personally introduce you to everyone. As a true libertarian which promotes true values of the individualism, I have nothing in common with the local chapter and will not kiss their asses. Lets the bolsheviks who hijacked the OC Libertarian party know that. Don’t be a Weenie. Come	to the meeting and I’ll buy you a beer.